Jeff Immelt deserves heaps o’ praise for dragging General Electric into the environmental age. The CEO’s Ecomagination campaign is timely, stirring, and spins the vast energy and finance systems of GE into a BP-like clean fusion. Except it’s damned hard for consumers to buy any of it. Take solar power, perhaps the most glaring market gap in our energy-starved, high-fuel-cost society. You’d think consumers would be lining up at GE in droves to slap solar panels on roofs to slash home utility costs … but search online and you find engineering gibberish. 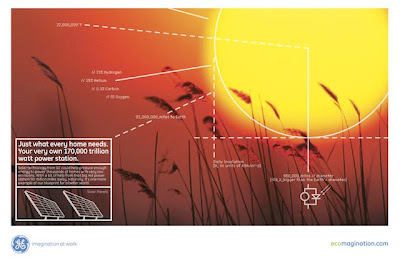 The GE site has links to the latest ads or brochures hinting at tax credits for solar energy. But no costs, no lead forms, no easy answers. It’s good to know that the size solar system you need (in kW) to power your home simply requires you to multiply your average daily electrical demand (in kWh) by 0.25, but if you don’t know your kW from your kWh, well, no solar for you. There’s a hint that these panels are expensive. GE notes its BrillianceTM solar electrical power system can supply 100 percent of your energy needs, but cutting your electricity by 40 or 50 percent is typically the most cost-effective approach. If we do the math, that means it must cost tens of thousands of dollars if we can’t achieve payback in just a few years. The ad has no phone number, no offer, no tickler to the nearest retail store. Where do you go for this future? The ad points to the web, which has links to a brochure, which on page 5 finally has the listing for a call center. To be fair, it’s probably unreasonable to expect GE to tout in ads you need to spend more on your roof than a BMW to really get off the grid. The technology isn’t there yet. Elsewhere online, solar panel wholesalers provide scant help, with charts comparing Watts to Amps and Volts. Word is Ikea sniffs the market opportunity and has low-cost solar panels on the horizon. Eventually someone will pick up the solar potential. There are 89.7 million homes in the U.S. with central heating and 60.1 million with central air; if only 5 million homes converted a year and dropped $3k each on solar panels — about what early adopters spend on flat-screen TVs — you’ve got a $15 billion industry. Until then, enjoy the sight of a rare open market niche beaming down at you from the clear blue sky. I tried to buy Solar at Home Depot a year ago or so. I filled in the form and a month or so later I got a return call and some stuff in the mail. Their convoluted financing scheme required me to buy the system (at a discount), they factored in the tax savings, and we somehow “split the profits” over a number of years. Despite having a high math background (differential equations anyone?) and two undergrad semesters of economics, I couldn’t do the math. I gave up. It was just too hard. Although solar energy isn’t all that economically feasible right now (with a 20-yr time period for most systems to pay for themselves), it’s an up and coming solution. New pv cells already provide 5x the power of the ones in the 1970’s, and that number is only going to increase as technology gets better and better. Home solar panels are already being made mandatory in some new construction, and this will help things along rather quickly.